Time has certainly tempered Reagan's detractors. The same critics, who considered him as a dunce and eagerly branded him as an inept leader, now are singing his praises. Dim-witted cowboy, a war monger, simplistic person with a low IQ, a fool, a weakling, figurehead, B-grade movie actor who sleeps during cabinet meetings - were the words frequently used to describe the President of United States. This was how the press saw Ronald Reagan during the eighties. There was relentless criticism of every move he made. 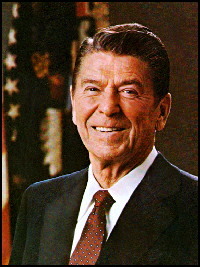 Reagan was the embodiment of ineptitude, a failed leader who chanced to get into White House, beating noble leaders like Jimmy Carter and Walter Mondale. When he was re-elected with a thumping (49 States voting for him against Mondale winning only his home state of Minnesota), the press thought that it was an aberration. No President has been elected by a larger majority in the history of United States but still that was not a mandate, according to the liberal press! Following the dictum that it is inappropriate to be critical of a dead man, the press is biting its tongue. Some of the more liberal newspapers have only printed lukewarm tribute to Reagan, who arguably was one of the most influential Presidents of the 20th century (along with Franklin D. Roosevelt). Reagan was a revolutionary President whose policies and ideas were at odds with the largely liberal press. Now however, the press is trying to make up for the guilt of being on the wrong side of history. History has treated Reagan as a hero for his accomplishments and resolve that changed the world for the better. The press ridiculed Reagan at every opportunity they got. Reagan was the cause of all evil. He caused homelessness and helped in spreading AIDS. He took medicine away from the elderly and food away from the poor. He did not care about the ordinary people. He was out of touch with the American people. He was blamed for not having a grasp on the world events and not knowing the details of governance (unlike Carter). He was not given the credit he deserved for his accomplishments. The booming economy of the eighties was the result of the 'excesses of the decade of greed', and the President was to be blamed for fomenting the greed. The crumbling of the Soviet Union was a result of Gorabachov glasnost policies and the result of a repressive country crumbling under its own weight. Reagan was only there for the ride and never a catalyst in hastening its demise. His whole Presidency was a bad Hollywood movie, where the main actor was clueless as to how he passed the audition! How well we remember the eighties, when the rabid press corps was waiting to go for the jugular of this conservative that was doing everything that was anathema to their own ideology.